Bodily injury or death caused by the use of the vehicle is covered. Any damage to the property caused by the use of the vehicle is covered. Insurance policy can be issued immediately. Lowest turnaround time in claim settlement. Commercial vehicle insurance is an insurance policy which covers your commercial vehicle against different types of external damages, along with personal and third-party liabilities. It provides coverage for any legal liabilities following death, injury or property damage of third parties, arising out of your vehicle use. Commercial vehicle insurance is necessary to keep your business running smoothly. Whether you own a small company with a single van or a company running an entire fleet of commercial vehicles, commercial vehicle insurance is both mandatory and useful. Getting the right level of commercial vehicle insurance, such as bus insurance, taxi insurance or truck Insurance at a price that suits you is important, especially when you are using your vehicle regularly for business. 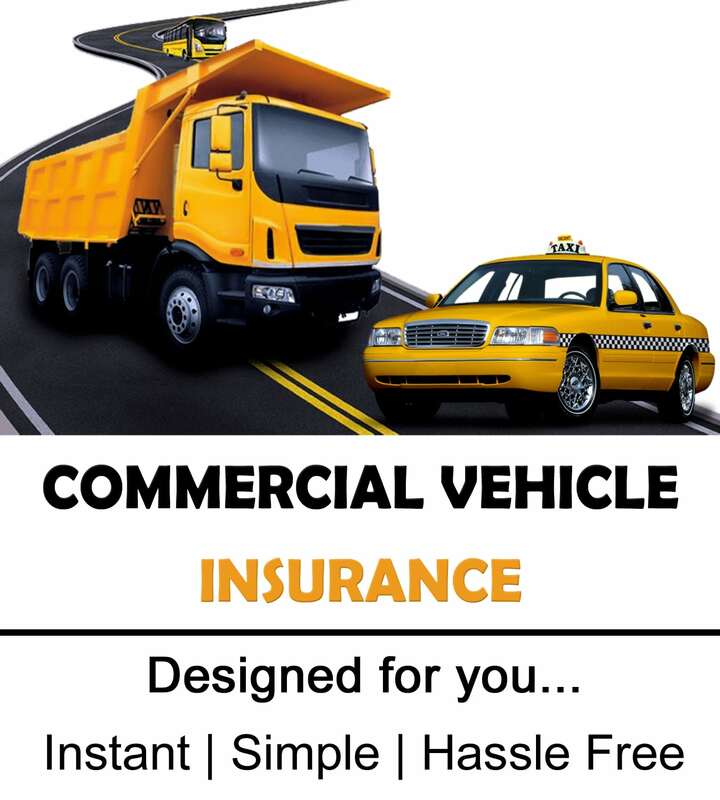 Commercial vehicle insurance offers policies to a wide range of commercial vehicles, such as Bus, Taxi, Tractor, Cranes, And a Range of Goods And Passenger Carrying Vehicles. You can insure your commercial vehicle through specialized commercial insurance policies such as Commercial Car Insurance, Bus Insurance, Taxi Insurance and Truck Insurance. Our commercial vehicle insurance plans do not only provide insurance coverage for the commercial vehicle, but also cover third-party liability. In addition to this, the plan also covers any financial losses due to accidental damage or theft of your vehicle. But why is Commercial Auto Insurance needed? Commercial auto insurance covers many situations, and provides insurance cover for automobiles that are not covered by a personal auto insurance policy. There may be certain vehicle types and usage of vehicles for business purpose that fall outside the ambit of a regular auto insurance policy. Therefore, Commercial auto insurance is a specific type of vehicle insurance cover that caters specifically to commercial vehicles, which are generally more at risk during use. This difference in risk factor is the primary reason how vehicle insurance policies for commercial purposes differ from personal auto policies. Who owns and drives the vehicle: If the vehicle is owned by a business, most likely, the vehicle will be covered under a commercial auto insurance policy. If the insured is a sole proprietor who uses the vehicle for commercial uses, then too he would need a commercial auto insurance policy. Moreover, the coverage needed within the commercial policy also depends on how often the vehicle is used and what it is used for. How the Vehicle is used: When an insured uses the vehicle for business purposes, he will need a commercial auto insurance policy. The Type and Weight of the Vehicle: If the vehicle you drive is heavier than a normal size pickup or SUV. For example, if it is as big as a dump truck, tow truck, semi-truck or commercial trailer, you will definitely require a commercial auto insurance policy. This is because this type of heavy duty vehicles can cause more damage if they are involved in an accident. Therefore, they also need special insurance coverage at times. Required Business Liability Limits: If your business vehicle requires higher liability limits, you will probably need a commercial auto insurance policy. In motor insurance business, commercial auto insurance policies offer higher liability limits than personal auto insurance policies. So, What Exactly Does Commercial Auto Insurance Cover in India? In India, commercial vehicles ply for all kinds of businesses. These days, whether a company owns a single van or an array of commercial vehicles, a commercial auto insurance policy is a must to hedge against unwanted risks and losses. What are the Features of Commercial Auto Insurance Policy? A commercial auto insurance policy covers risks such as bodily injury or death caused by the use of the vehicle. A commercial auto insurance policy covers third party liabilities such as bodily injury to the third-party or damage of third-party vehicle. It also covers legal liabilities arising out of death, injury or property damage to the third-party by the insured’s vehicle. What do Businesses look for in a Commercial Vehicle Insurance Policy? Businesses look for competitive rates and good customer service when looking for any kind of insurance cover. It is the same with a commercial vehicle insurance policy. When buying a commercial vehicle insurance policy, customers look for a company that offers the best premium rates. Moreover, customers look for easy procedures for enrolment and renewal. They also want the insurance company to be capable of settling the claims in the lowest possible turnaround time. ⦁ Policy documents that are digitally signed can be issued immediately. ⦁ For fresh or renewal covers, the company offers door step arrangements including arrangements for free inspection with regards to break in insurance cases. ⦁ The company has a large fleet of trained in-house surveyors. This helps in faster surveys on vehicles and quicker turnaround time while attending to claims. ⦁ The company also follows online e-survey claims module for lowest turnaround time in claim settlement. ⦁ The company has 24x7 call center service is in place, for any support relating to claims. The third party only policy covers for third-party injuries and property damage to their vehicle. It doesn’t cover the insured for any loss. A2Z Insurance and Financial Services has fared consistently well on each and every of these aspects, which is why it is a highly preferred option for commercial vehicle insurance. A customer can see comparative truck insurance rates and buy what is suited to his requirements. The payment can be made online via debit/credit card and internet banking. The customer needs to send certain relevant documents via email. The rest of the tasks like submitting the documents, coordinating with A2Z Insurance & Financial Services and getting the policy issued to the customer can be done through our Office. Commercial vehicle insurance premium is higher for 4-wheelers as compared to three wheelers. In other words, the premium rate for a truck is therefore higher than that of an auto rickshaw. Moreover, the cubic capacity of the vehicle and licensed carrying capacity are two factors that determine the premium rates in commercial vehicle insurance. There is also provision of reducing the premium by accumulating NCB that is, no claim benefit. Competitive premiums can be offered to those who are members of Automobile Association. Package Policy: This covers loss or damage to the truck. The loss or damage can be due to accidents or thefts. It also includes third party liability insurance which is a compulsory policy for every motor vehicle owner in India. Liability only Policy: This covers third party liability for injuries, fatalities, and property damage. It also includes personal accident cover for a driver who is also the owner. The liability only cover is narrower in scope than the package policy. The Online Commercial Auto Insurance policy referred from A2Z Insurance & Financial Services gives coverage for legal liabilities following death, injuries, or property damage to third-party due to any accident where the insured’s vehicle is involved. There are add-on covers available as well at competitive rates. ⦁ Coverage for damage to the vehicle due to theft, vandalism, fire etc. Sometimes, bus insurance covers especially in advanced countries also include. Medical Payments coverage for driver and Passengers in the other vehicle, Especially for a passenger who doesn’t have adequate health Insurance. In advanced Countries, if the bus carrier is that of School Students, it is Considered Prudent to take a policy that will cover the driver and other employees against molestation or child abuse. What are the factors that determine bus insurance cost? ⦁ Whether the bus travels within city, highways or across state boundaries or international border. The amount of company asset or asset related to the vehicle, the insured needs to protect in the event there is a lawsuit against him. Finally, remember the amount of coverage one needs for commercial vehicle insurance corresponds with the amount the insured is exposed to. This is true for all vehicles whether, it’s for trucks, taxis, or buses. In India, bus insurance is provided by general insurance companies who deal with commercial auto insurance. What Features Are Excluded from Commercial Vehicle Insurance Plans? ⦁ Customer’s Requirements: Insurance requirements vary from customer to customer. Liability coverage is an important part of commercial auto insurance. It safeguards third parties against damage or injury caused by the insured’s vehicle. These days, uninsured motorist cover has become an important feature of auto insurance covers. This type of cover will protect the insured against any accident or injury caused by a third-party whose liability cover is not adequate to compensate the insured fully. ⦁ Compare the Insured Declare Value: It is the current market value of the vehicle and the maximum sum assured fixed by the insured. The insured can avail this amount in case of total loss of vehicle due to theft etc. ⦁ Compare Insurer’s Claim Settlement Practice: How fast a company settles claims is an important deciding factor for customers to buy an auto insurance policy from the company. Every company has its own procedure that they follow for settling claims. Businesses look for a hassle-free claim process and opt for the company that best suits their needs. There are other factors that are also taken into account while comparing different products. No Claim Bonus: For every no claim year, the insured is rewarded with a discount on the renewal premium. The no claim bonus is cumulative and increases every year. This bonus can be in the range of 20-50% on premium payable. However, it is important to remember that a ‘No Claim Bonus’ is not the insured’s right but something the insured earns by maintaining a no-claim record during the policy tenure. Personal Accident Riders: Personal Accident Riders are optional add-on benefits. They can be added to a plan by paying an extra premium. These add -on benefits include payment to insured in the period he is not able to earn due to complete or any partial disabilities. Cover for Commercial vehicle Accessories: Cover for vehicle accessories are provided by commercial vehicle insurance policies separately as an add-on benefit. The insured has to opt for it through payment of an additional premium. The insured can save on premium by paying higher deductibles. The insured can opt to pay higher deductibles at the time of enrolment, and the insurance company in turn gives the insured discount on the premium. Vehicle Make, Model and Variant: The base premium is calculated based on the make, model and variant of the commercial vehicle. Vehicles that are powerful and expensive attract more premiums. Year of Manufacture: The manufacture year of the vehicle is important as the insurance company has to assess the Insured Declared Value (IDV), which facilitates the vehicle insurance company to decide on the annual premium for the commercial vehicle. Additional Covers: The insured needs to mention about any additional covers he may want from the vehicle insurance company. Additional covers for vehicle accessories for example come at a higher premium. It also provides cover against Legal Liability to third party personal injury and property damage arising out of an accident invulving the vehicle as required under Motor Vehicle Act. The Policy further provides for compulsory Personal Accident cover for owner driver. Note: The above are only the salient features of the Policy, for complete terms and conditions please refer to Company’s Policy Wordings.